In Facebook news, they are rolling out Facebook Watch Party for Groups. Facebook is rolling out Facebook Watch Party. Watch Party is a way for you to watch videos on Facebook with others and interact with them in real-time. Right now, it is only available for Groups, but they are testing this feature for Pages as well. Overall, holding a Facebook Watch Party can have its benefits, regardless of how many people you have in your Facebook Groups. For example, you could create your own watch party to discuss a recent blog post you published. Others might hold a Facebook Watch Party to answer Q&A's from customers or readers. As a business, we would use the watch party feature to hold discussions within our Facebook Groups to gather feedback from our best group members and to further discuss our latest blog post and to answer questions that readers might have. Since they are available to everyone, your options are endless. The only requirement is that you have a Facebook Group to use them in. Let us know how you plan to use a Facebook Watch Party in the comments below. We would love to hear what ideas you come up with. To read more about Facebook Watch parties for Groups, click here. Also this week, Facebook Messenger can now sync Instagram contacts. Is Facebook Messenger your primary way you communicate with your customers? How would you like to grow that list by syncing your Instagram contacts? In the "people" tab in Messenger, you'll now see an option to sync your Instagram contacts. When you sync your Instagram contacts in Messenger, your Instagram account and username become visible to your contacts in Messenger. Overall, while some users might not appreciate have all of their contacts synced between the services, it helps to create a more unified Inbox within Facebook and their various platforms. As a business, one positive side to syncing your contacts between Instagram and Facebook Messenger is that all of your contacts will be synced in one place. You'll also have less places to check and instead, can focus more on building stronger relationships with your customers. To read the announcement about syncing Instagram contacts and Facebook Messenger, click here. In YouTube news, you can now add hashtags to YouTube video titles and descriptions. Would you like to improve your YouTube search rankings? How about increasing exposure for your business among viewers? YouTube is rolling out using hashtags throughout their services for Android users (for now). For example, you can include up to 15 hashtags throughout various places in your YouTube videos, such as in the title and description of your videos. You can also use hashtags in YouTube search as well to help locate content using a specific hashtag. When you click on a hashtag, it will bring up a page of related videos. 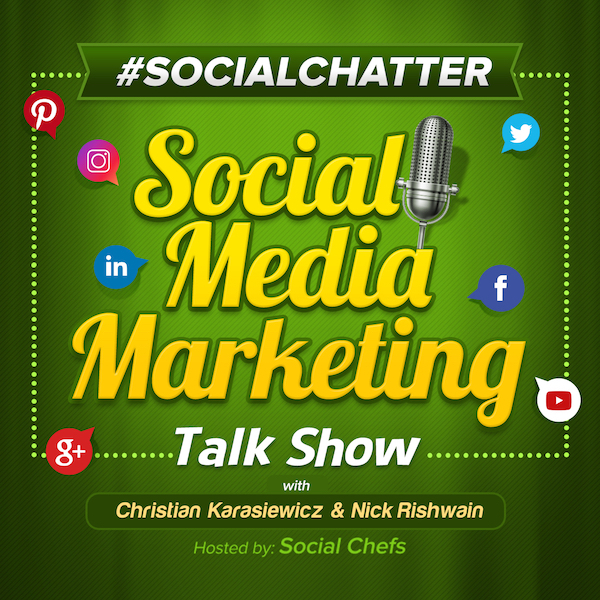 As a business, if you use a hashtag - for example, we use #SocialChatter for our weekly social media marketing talk show, we will be able to quickly find other users who may have shared our video on their channel or quickly find all of our videos related to a hashtag campaign. Your business can do the same if you have created your own hashtag. Remember, if you don't currently have your own hashtag, you can always start your own to use throughout your businesses marketing efforts. To read more about adding hashtags to your YouTube videos, click here. In LinkedIn news, they are adding new LinkedIn posting features. LinkedIn is rolling out a host of new features to use when posting on LinkedIn. These include: video captions, sharing quotes and post translations. First up, LinkedIn is now letting you include captions with your videos. This is important because not everyone can always watch a video with the sound on. By adding video captions, you will be able to help your videos reach everyone. To add video captions from your desktop, click on the video icon when you go to make a post. From there, select your video and then video settings icon. There, you can add your own SRT file (SubRip Title). A second feature being added is the ability to easily share quotes from articles on your LinkedIn account. On mobile, you can now select a quote from an article to share on LinkedIn. This can be useful if you're a busy business owner, always on-the-go. Now, you can share something you found useful from an article from mobile. Another new feature from LinkedIn are drafts on mobile. Now you can start creating a post from your mobile device and have it saved to drafts if you are interrupted. This way you can finish it later on. Do you have people in your LinkedIn network who could benefit from your posts, but they don't speak the same language? Now that won't be a problem, as LinkedIn has added the ability for them to translate your post into their native language. When they see your post in their LinkedIn News Feed, they can click on "see translation" to switch to a different language. Overall, these new features will help enhance your usage of LinkedIn and give you more options to reach your customers. You can read more about these new LinkedIn post enhancements here. In Snapchat news, they are replacing Snapcash with Venmo. In surprising news for the floundering company, Snapchat is replacing Snapcash, a service they developed with Square, with Venmo. Snapcash will shutdown, starting August 30. There is no timetable when Venmo will officially replace them in the Snapchat app. Snapcash was a convenient way for Snapchat users to send money between one another. As a business, this may make it easier for you to take payments from customers, as Venmo is more widely known. Overall, we hope that Snap continues to use the name, Snapcash, as it has a nice ring to it and fits their product naming conventions. You can read more about Snapchat replacing Snapcash for Venmo here. The first tool that we have discovered this week is called WonderLens (iOS). WonderLens uses augmented reality to help you create videos from your iOS device. While there is no shortage of video applications, many of them rely on you making manual edits. WonderLens is different, as it relies on using augmented reality to help you quickly select parts of your photos or videos automatically, with precision. This way you can create videos in less time. You can download WonderLens for free from the link below. The second tool that we have for you this week is Biteable (web). Would you like to create better quality how-to videos? Maybe you need an explainer video or want to share a new blog post in a new and creative way? Biteable is a powerful video editing tool to help you quickly create videos to promote your content. With Biteable, you get access to a host of drag-and-drop templates for creating how-to videos, videos for Instagram and more. You can create your first video in Biteable in minutes for free using the following link.